Portraits of a City features artwork from New-York Historical's collection, depicting New York City from the colonial era to the late 20th century. The installation showcases the subsequent commerce and architecture that flourished over the centuries in this dynamic port city. The works on view range from representations of important sites and buildings, such as the Empire State Building, the Brooklyn Bridge, and Times Square, to illustrations of historic events, including Revolutionary War battles and the Great Fire of 1835. Through these depictions, artists have left their own stamp on New York’s cultural history, reflecting our enduring fascination with the city and its people. 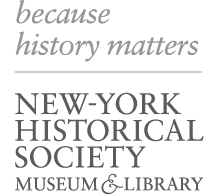 Exhibitions at the New-York Historical Society are made possible by Dr. Agnes Hsu-Tang and Oscar Tang, the Saunders Trust for American History, the New York City Department of Cultural Affairs, and the New York State Council on the Arts with the support of Governor Andrew Cuomo and the New York State Legislature.